The Burmese Harp is a 1956 Japanese film directed by Kon Ichikawa. It opens in August 1945, focusing on a Japanese Army unit that is trying to escape to Thailand ahead of the British advance. Private Mizushima has acquired a Burmese harp that he plays while the men of his unit sing on the march. One day Mizushima's unit, led by Captain Inouye, is relaxing in a Burmese village when they realize that a British unit is advancing on their position. The squad starts singing to cover the noise while they form in combat formation—only to be answered by the British singing "There's No Place Like Home". Inouye's unit thus finds out that Japan has surrendered and the war is over. 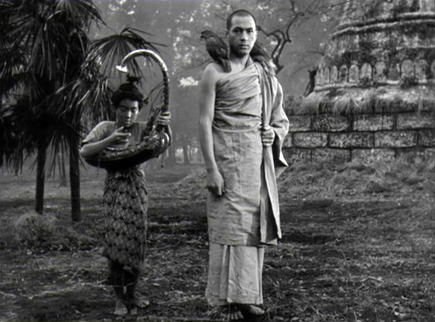 The Burmese Harp was nominated for the Academy Award for Best Foreign Language Film but lost to La Strada. In 1985 Ichikawa remade the film in color. Band of Brothers: The men of Mizushima's unit hand over all their meager possessions to a local woman in order to get word of what happened to him. Becoming the Mask: Mizushima steals a monk's robes in order to evade capture as a POW. In the end, he has become a monk. Circling Vultures: As Mizushima is trying to make his way back to his unit's POW camp, he stumbles across a ravine littered with Japanese corpses, with vultures already snacking. Dies Wide Open: Most of the soldiers in the unit that Mizushima fails to talk into surrendering. Due to the Dead: Mizushima becomes dedicated to doing this. He buries some of the bodies he finds in the ravine, then later gets some help from locals to bury a ghastly pile of Japanese corpses he finds by a river. A Father to His Men: Capt. Inouye is desperate to find Mizushima, and regrets not going on the mission to the other unit himself. Finger-Twitching Revival: This is how Mizushima, knocked unconscious by the British bombardment, is shown to still be alive. Gone Swimming, Clothes Stolen: A rare non-comic, non-sexual example of this trope. The monk that rescued Mizushima from the cave and nursed him back to health takes a bath in a river one day. Mizushima promptly steals his monk's robes and takes off, intending to avoid capture by the British. I Choose to Stay: Mizushima elects to stay behind in Burma, burying bodies, rather than go home with his comrades. POW Camp: Much of the action takes place in the camp where the soldiers are held after they surrender. The Remnant: Mizushima begs the Japanese unit holding out in a mountain cave to surrender. They refuse angrily, and are destroyed. Single Tear: From Mizushima, after finally meeting his old comrades inside the POW camp, before he turns and walks away forever. Walking the Earth: Mizushima's fate, as he explains in a letter to Capt. Inouye that Inouye reads to the men as they are sailing for home. He has determined to stay behind in Burma, wandering around and giving a decent burial to any dead Japanese soldiers that he finds.